Barcelona made a winning start to their Champions League campaign as they edged past Apoel Nicosia at the Nou Camp. Gerard Pique's header from Lionel Messi's inswinging free-kick was enough to beat the champions of Cyprus. Apoel keeper Urko Pardo made two fine saves to deny Messi on a frustrating night for the hosts in Spain. Elsewhere, Roma hammered CSKA Moscow 5-1 and Yacine Brahimi scored a hat-trick as Porto thrashed Belarusian champions Bate Borosov 6-0. Gervinho has scored as many goals in one Champions League game for Roma as he did in 11 matches for Arsenal. Porto have scored five goals in a Champions League game for the first time since March 1994. Roma have scored five goals in a Champions League game for the first time. Barcelona started with three-time Champions League winner Andres Iniesta on the substitutes' bench. But the likes of Messi, Neymar and Dani Alves made hard work of overcoming a stubborn Apoel side. The all-important goal came in the 28th minute, former Manchester United player Pique nodding home from six yards after connecting with Messi's set-piece. It required a full-stretch save from debutant keeper Marc-Andre Ter Stegen to deny Apoel's Gustavo Manduca a dramatic stoppage-time equaliser. Barcelona's Group F rivals Paris St-Germain and Ajax drew 1-1 in Amsterdam. Edinson Cavani had given the French champions the lead only for Lasse Schone to equalise in the 74th minute. Roma made up for lost time as they marked their return to the Champions League group stages after a three-year absence with an emphatic 5-1 victory over CSKA Moscow. Former Arsenal striker Gervinho scored twice as the Russian champions trailed 4-0 at the interval in Rome. Juan Iturbe, Maicon and an own goal by Sergei Ignashevich completed the scoring, while Ahmed Musa netted a consolation for CSKA. Gervinho scored as many goals in one Champions League game for Roma as he did in 11 matches for Arsenal. The match was stopped for two minutes in the 71st minute when CSKA supporters began throwing flares at Roma fans and riot police had to intervene. Ex-England and Chelsea left-back Ashley Cole was an unused substitute for Roma, who travel to Manchester City next on 30 September. The biggest scorers of the night were Porto as Bate Borisov were crushed 6-0 in Portugal. They were inspired by Brahimi, the Algeria World Cup winger helping himself to three goals. Jackson Martinez, Adrian Lopez and Vincent Aboubakar also scored. There was a dramatic finish in Slovenia where Maribor scored a stoppage-time equaliser to deny Sporting Lisbon victory in the same group as Chelsea. Nani, on loan from Manchester United, looked to have earned the Portuguese club all three points with a fabulous 20-yard strike until Luka Zahovic sent home fans into raptures as he made it 1-1. Athletic Bilbao, in the group stages for the first time in 16 years, were held to a 0-0 draw at home to Ukrainian champions Shakhtar Donetsk. Match ends, Barcelona 1, APOEL Nicosia 0. 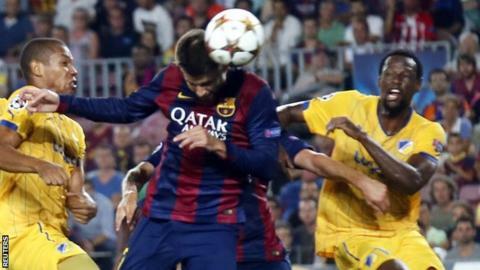 Second Half ends, Barcelona 1, APOEL Nicosia 0. Corner, APOEL Nicosia. Conceded by Marc-André ter Stegen. Attempt saved. Gustavo Manduca (APOEL Nicosia) left footed shot from outside the box is saved in the top centre of the goal. Assisted by Rafik Djebbour. Attempt blocked. Lionel Messi (Barcelona) left footed shot from very close range is blocked. Attempt saved. Neymar (Barcelona) right footed shot from the centre of the box is saved in the centre of the goal. Attempt blocked. Lionel Messi (Barcelona) right footed shot from the centre of the box is blocked. Assisted by Neymar. Attempt missed. Sandro Ramírez (Barcelona) left footed shot from outside the box is close, but misses to the right. Assisted by Sergi Samper. Corner, APOEL Nicosia. Conceded by Marc Bartra. Gustavo Manduca (APOEL Nicosia) wins a free kick in the defensive half. Offside, APOEL Nicosia. Mário Sérgio tries a through ball, but Konstantinos Charalambidis is caught offside. Vinicius (APOEL Nicosia) wins a free kick on the right wing. Offside, Barcelona. Adriano tries a through ball, but Sandro Ramírez is caught offside. Substitution, Barcelona. Rafinha replaces Sergi Roberto. Substitution, APOEL Nicosia. Konstantinos Charalambidis replaces Tomás De Vincenti. Attempt missed. Tomás De Vincenti (APOEL Nicosia) left footed shot from outside the box misses to the left. Assisted by Gustavo Manduca following a fast break. Foul by Rafik Djebbour (APOEL Nicosia). Carlao (APOEL Nicosia) wins a free kick in the defensive half. Attempt missed. Sandro Ramírez (Barcelona) right footed shot from a difficult angle on the right misses to the right. Assisted by Andrés Iniesta with a through ball. Substitution, APOEL Nicosia. Rafik Djebbour replaces Cillian Sheridan. Attempt missed. Lionel Messi (Barcelona) left footed shot from the right side of the box misses to the left. Attempt blocked. Adriano (Barcelona) right footed shot from outside the box is blocked. Assisted by Lionel Messi. Corner, Barcelona. Conceded by Mário Sérgio. Attempt missed. Neymar (Barcelona) header from the centre of the box is close, but misses to the right. Assisted by Dani Alves with a cross. Attempt saved. Adriano (Barcelona) right footed shot from the left side of the box is saved in the centre of the goal. Assisted by Lionel Messi. Munir El Haddadi (Barcelona) wins a free kick in the defensive half. Foul by Mário Sérgio (APOEL Nicosia). Corner, APOEL Nicosia. Conceded by Dani Alves. Corner, Barcelona. Conceded by Carlao. Substitution, APOEL Nicosia. Gustavo Manduca replaces Tiago Gomes.